It's that time of year again. The first DVD screener has just made its way onto various pirate sites. This year the honor goes to Louis C.K. 's "I Love You, Daddy," which was dropped by distributor The Orchard recently. The film was carefully chosen by release group Hive-CM8, who say that it would be a waste if nobody ever gets to see it. but more than a dozen made their way online soon after. Today the first leak of the new screener season started to populate various pirate sites, Louis C.K.’s “I Love You, Daddy.” It was released by the infamous “Hive-CM8” group which also made headlines in previous years. “I Love You, Daddy” was carefully chosen, according to a message posted in the release notes. Last month distributor The Orchard chose to cancel the film from its schedule after Louis C.K. was accused of sexual misconduct. With uncertainty surrounding the film’s release, “Hive-CM8” decided to get it out. “We decided to let this one title go out this month, since it never made it to the cinema, and nobody knows if it ever will go to retail at all,” Hive-CM8 write in their NFO. 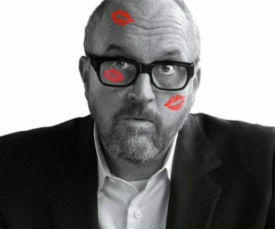 “Either way their is no perfect time to release it anyway, but we think it would be a waste to let a great Louis C.K. go unwatched and nobody can even see or buy it,” they add. It is no surprise that the group put some thought into their decision. In 2015 they published several movies before their theatrical release, for which they later offered an apology, stating that this wasn’t acceptable. Last year this stance was reiterated, noting that they would not leak any screeners before Christmas. Today’s release shows that this isn’t a golden rule, but it’s unlikely that they will push any big titles before they’re out in theaters. “I Love You, Daddy” isn’t going to be seen in theaters anytime soon, but it might see an official release. This past weekend, news broke that Louis C.K. had bought back the rights from The Orchard and must pay back marketing costs, including a payment for the 12,000 screeners that were sent out. Hive-CM8, meanwhile, suggest that they have more screeners in hand, although their collection isn’t yet complete. “We are still missing some titles, anyone want to share for the collection? Yes we want to have them all if possible, we are collectors, we don’t want to release them all,” they write. Finally, the group also has some disappointing news for Star Wars fans who are looking for an early copy of “The Last Jedi.” Hive-CM8 is not going to release it. “Their will be no starwars from us, sorry wont happen,” they write.